Please see the UPDATED version of this post. Everyone should really be using Unicode for Greek fonts now, but there are still a few publishers who request Greek be rendered in one of the older legacy fonts. 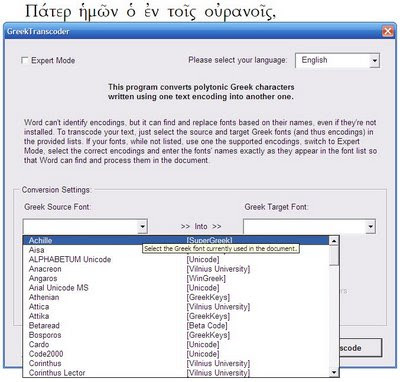 You may also have some older documents with non-Unicode Greek fonts, and you want to convert them to Unicode. The problem with the older TrueType fonts (e.g., Sgreek, SPIonic, Graeca, etc.) is that they each have their own character encoding, so there is no single way to convert these fonts to Unicode. What's the solution? 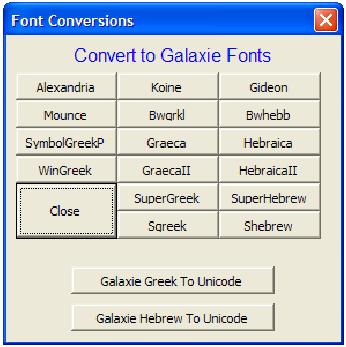 I have gathered all the Greek font converters of which I am aware. Many of them allow conversion to/from Unicode. Note that it is possible to convert from a legacy font to Unicode back to a different legacy font if necessary. Also note that most of the converters are Microsoft Word macros or templates. If you try to convert a file that has footnotes with Greek, the footnotes might not get converted. There is also a Unicode > bwgrkl posted here. Thanks for doing all this. It's good to know were to go for all these. Good to have. I have included it on my blog. Have you seen one that converts Greek Parse? My friend, you have no idea how long I've been looking for this kind of information, and finally I've found it!! Thank you so much! Nice post, which is very useful and well-referenced on Google. Perhaps you should also mention Antioch, which is a Word plugin that does a good job of conversion from a variety of formats (LaserGreek, SuperGreek). 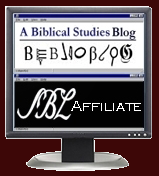 How do I evaluate Bible software? What's the point of Bible software?